The Brazos Valley (/ˈbræzəs/ ( listen) BRAZ-əs) is a region in the U.S. state of Texas (a subsection of the larger Central Texas region) consisting of the counties of Brazos, Burleson, and Robertson (which collectively comprise the Bryan–College Station metropolitan area), and the neighboring counties of Grimes, Leon, Madison, and Washington. The area is centered on Brazos County, the cities of College Station and Bryan, and Texas A&M University. Although the Brazos River lies at the center of the region, not all areas of the region are a part of the Brazos watershed. The population of the region was estimated to be 278,696 in 2003 by the U.S. Census Bureau. It covers 5,109 square miles (13,230 km2). 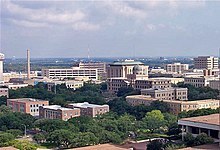 Texas A&M is the center of the economic and social life of the Brazos Valley. This Texas state location article is a stub. You can help Wikipedia by expanding it. This page was last edited on 27 July 2018, at 16:53 (UTC).